Rights leaders support greater public awareness of WWII JA incarceration. Assemblymember Al Muratsuchi announces Assembly Bill 491 which would provide $3 million for civil liberties education programs on Wednesday in Sacramento. He is joined by former Rep. Mike Honda (left) and Basim Elkarra, executive director of Council on American-Islamic Relations. 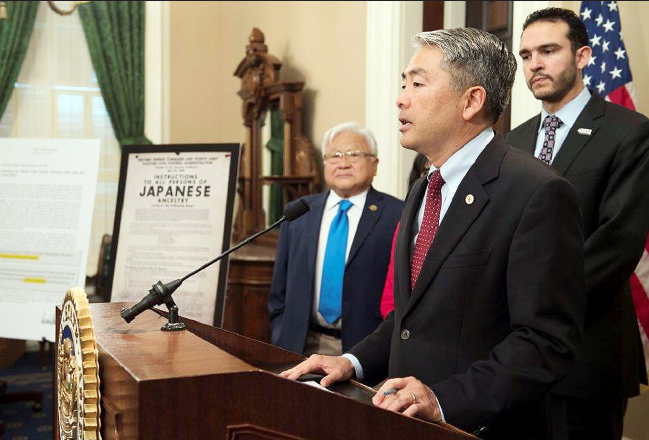 SACRAMENTO — Assemblymember Al Muratsuchi (D-Torrance) on Wednesday called for $3 million in grants to the State Library for educational activities and materials on civil liberties and the World War II Japanese American incarceration. He made his remarks at a Capitol press conference, where he stood with colleagues from the State Assembly and leaders from the Muslim, Asian Pacific Islander, Jewish and Latino communities in solidarity to ensure that history doesn’t repeat itself in the Trump era. Muratsuchi’s Assembly Bill (AB) 491 would ensure that more Californians could learn these historical lessons. It was 75 years ago that President Franklin D. Roosevelt signed Executive Order 9066, which led to concentration camps for Japanese Americans. Karen Korematsu, the executive director and founder of the Fred T. Korematsu Institute, spoke about the lessons learned from her late father, whose challenge to the constitutionality of the incarceration was rejected by the Supreme Court in 1944. Muratsuchi was also joined by former Rep. Mike Honda (D-San Jose), who was detained as an infant with his family in the Amache camp in Colorado, and Assemblymember David Chiu (D-San Francisco), a member of the API Legislative Caucus.